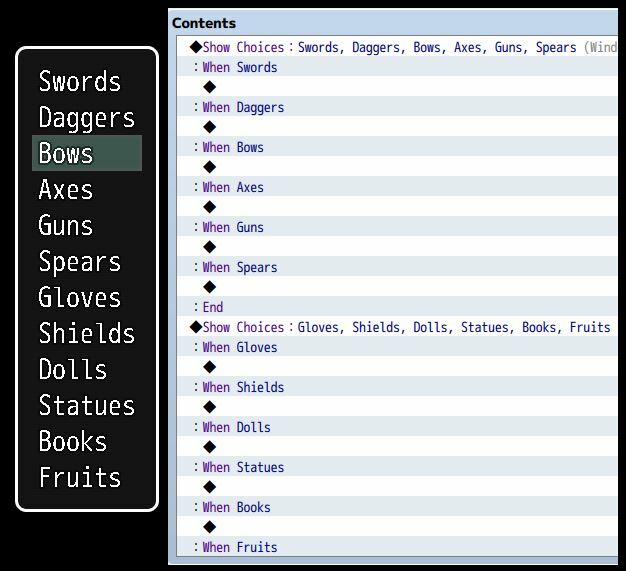 The Show Choice event command allows you to present players with a set of options that they can choose from. Depending on their selection, your event would respond according to their choice. 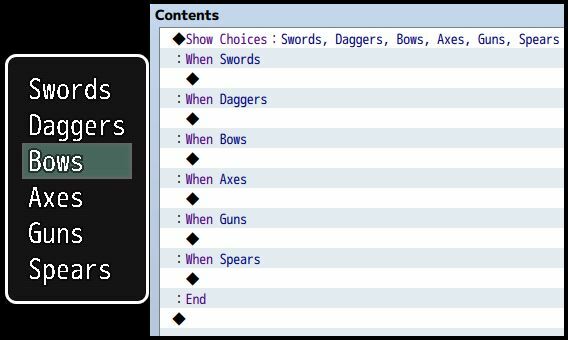 By default, RPG Maker provides you with a maximum of 6 choices when you create Show Choice commands. This means that, at anytime, you may present up to 6 choices. However. what happens if you would like to display 7 choices? Or 8? Maybe more? You would need to come up with a method that will allow players to view all selections, but at the same time work around the 6-choice limitation. Rather than having to figure out how to do that, this plugin makes your job easier by directly allowing you to create choice selections with more than 6 options. Need more than 6 choices? Download the plugin and try it out! 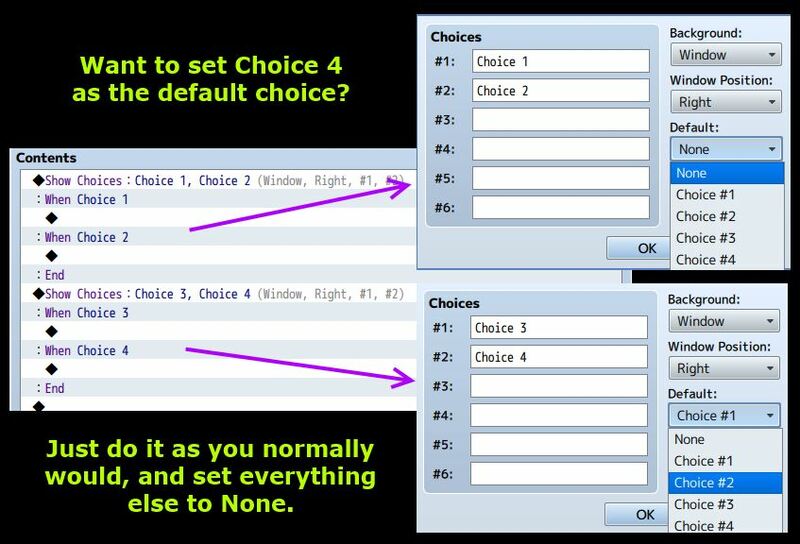 Choice Display Mode – Change the way your choices are presented! Download the plugin and place it in the “plugins” folder in your project’s “js” folder. Then open your Plugin Manager (F10), double-click an empty row, and select the LargeChoices plugin. This screenshot is only for illustration purposes. By default, the number of choices that will be displayed is limited depending on how much space is available on your screen. The choice window will allow you to scroll through choices that aren’t immediately available. If you don’t want to combine choices together, add a comment between show choice commands. The default choice is relative to the choice command that the choice belongs to. It works the same way as you would normally do, except you just have to set all of the other ones to None. 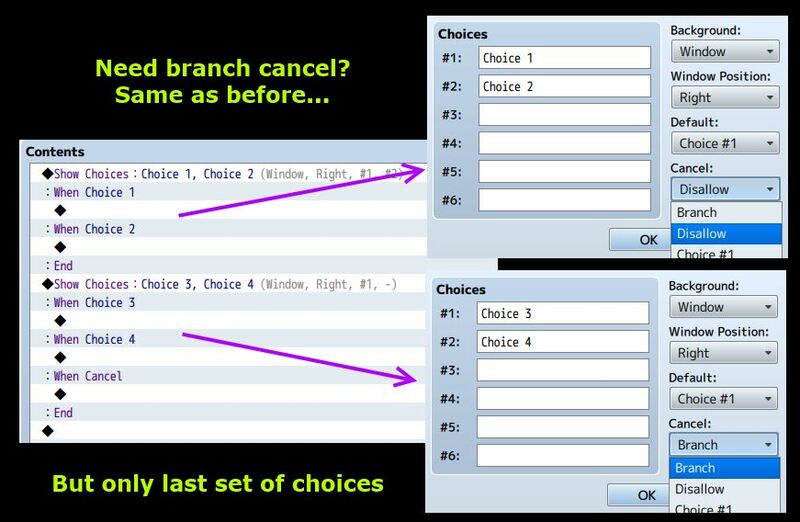 Choosing the correct cancel choice is similar to choosing a custom default choice. Just set up one of the choices and make sure the others are disallowed. Nevermind found it! im blind lol. Hi, this does mot work for me at. I’ve followed the instructions and it just doesn’t combine the choices. Would it be possible to make choices into Columns too? For some reason this plugin is not functioning for me and I can’t figure out why. I’ve tried using it with no other plugins, so it’s not a confliction problem. I’ve done everything that you say to do and still the two show options won’t combine into one large box of choices when I play the event. What do you think is going wrong for me? There was a bug introduced recently. I have updated the plugin to address the issue. Just download the latest version and it should work when you run the event. Sorry to be a bother, but funny thing is, your Hidden Choices Plugin is now failing to work. Sorry, but could you look into that too? I’m trying to figure out what I may be doing wrong, but I’m having a hard time figuring this out. Thank you for all the hard work you do! Actually the hidden choices plugin works when I use the command: “hide_choice Num”, but not when I use the command: “hide_choice(Num, Condition)”. The second one is a script call, not a plugin command. I seem to notice a problem when using the right click option to test when a choice is the last event command to test. It gives the error “Cannot read property ‘code’ of undefined,” and goes away after I disable the plugin. It still happens in a project with only Large Choices. What do you mean by “when a choice is the last event command”? Can you show an example of the event? What if you create a new event with only two choices instead of 5? Still does it. If you test with any show choices at the end, it gives the error. Still me. Did it from a new computer. If you add event commands to the choices, you will get the error. Oh, “test” was referring to the event test function. I thought you were just playtesting and trying to right-click when the choices were shown. Plugin has been updated to address the issue. I turned the MessageCore.js off in RMMV. Disable all other plugins and see if the problem still occurs. Maybe there’s something about the way the event is setup? There is nothing else around the event. And of course I use the latest version. Looks like a pretty normal event. Use this demo to set up your event here demonstrating the problem and then send it to me. Choices 2 or Choices 3 first will be invalid. really? its fine for me. Does the issue occur in a new project with only large choices? Maybe there is another script that it conflicts with? Do you plan on expanding the plugin’s functionality? Choices are pretty bland as is. It’d be nice to have a Help window displayed for each choice as they’re highlighted. Also, having choices greyed out based on switches being on/off would be cool. Yes, they will be released as separate plugins. Yes, I will be porting that over the next few weeks. I don’t use skype much. You can reach me on Twitter or my Facebook page. Previous story Is RPG Maker MV Over-Priced?